Parasols should be popping up all across the UK at the moment. Paul Stamets in Mycelium Running calls them “one of the most majestic of all edible mushrooms.” The second part of the Latin name Macrolepiota procera literally means lofty, upraised or extended to a great height, and they are certainly hard to miss on late-Summer and Autumn forays. The Parasol mushroom starts out looking something like a drumstick, before the initially egg-shaped cap opens up to a maximum size of around a foot across (typically between 10-30cm) when fully grown. The stem extends to around 15-30cm and, ranging between 1-3cm in width, it is relatively thin. It is also hollow, fibrous, flecked with brown-to-black scales and bulbous at the base. A further key identifying feature is the pronounced double-edged movable ring just beneath the cap, looking like an Elizabethan ruff. 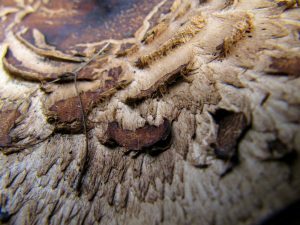 The cap itself is scaly and the very definition of ‘umbonate’, a descriptive term used by mycologists that refers to fungi that have a raised area, or ‘umbo’ (like the boss in the centre of a shield). This large umbo area is a darker brown or grey-brown than the rest of the cap, which is pale cream to buff in colour. In fact, the reason the centre of the cap is darker is because this is where the scales radiate from. 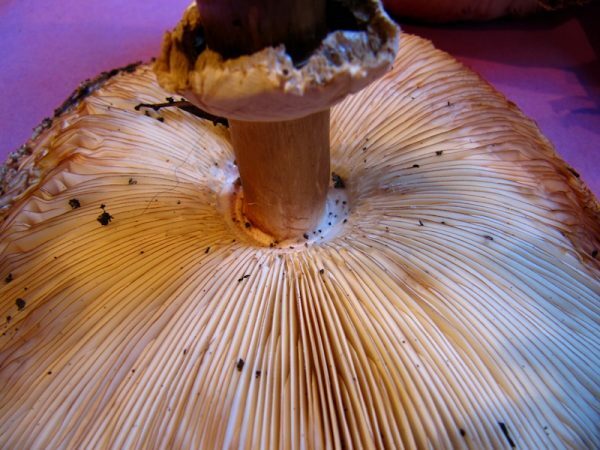 Both flesh and gills are white, with the latter described as “free” in mycological terminology, in that they are not attached to the stem (i.e. they are free of the stem). If you can tick all these boxes, then you almost certainly have a Parasol, because this species doesn't have many lookalikes, at least not in this country. There is the aptly named False Parasol, or Chlorophyllum molybdites, but this is a North American species and as Evans and Kibby note in Pocket Nature: Fungi, it “only very rarely occurs in Europe as an exotic alien in hothouses, botanical gardens and mulch beds” (I wrote more about non-native species found in these kind of environments a few months ago. 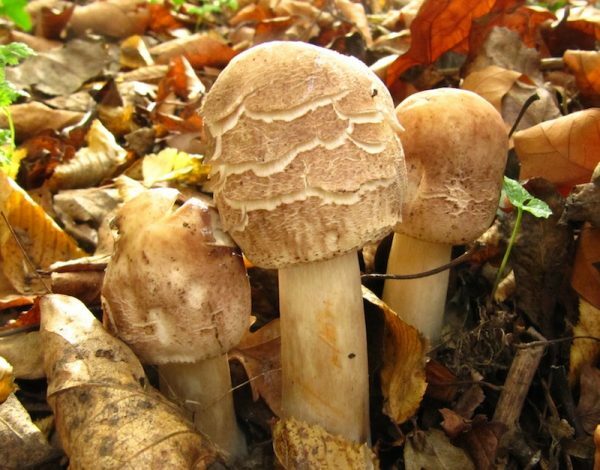 Most UK fungi guides don’t even mention the False Parasol, including Roger Phillip’s bible Mushrooms and other Fungi of Great Britain & Europe. 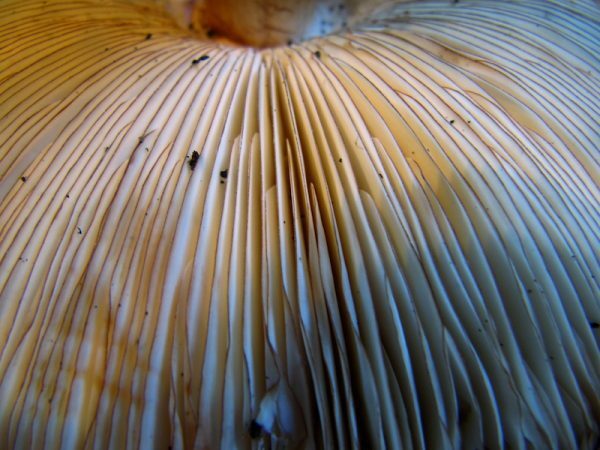 From online photos and the illustration in Evans and Kibby, one can see that the pattern on the cap is pretty distinct from a genuine Parasol, and also the gills turn “distinctly pale green” as they age. 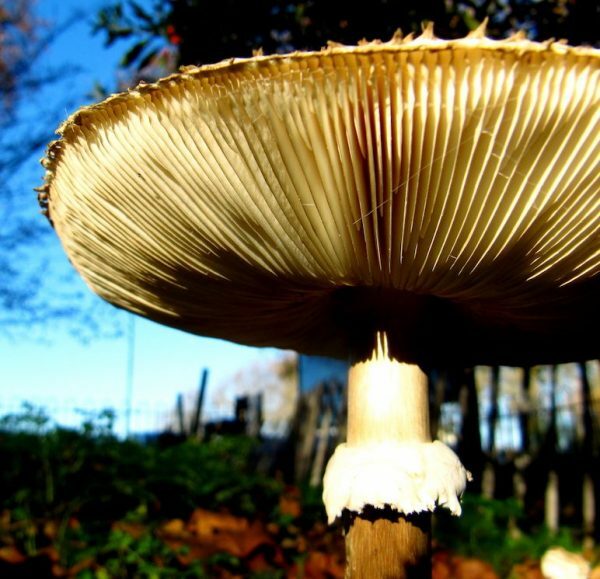 To add another layer of certainty, lay down the cap on a black piece of paper for a few hours, and you will see that the spore print of the Parasol is white, while the False Parasol’s is green, hence the Chlorophyllum (“green gills”) part of its Latin name and the alternate English name, the Green-spored Parasol. Habitat is another good thing to go on when identifying Parasols. They commonly grow, as Gerrit J. Keizer states in The Complete Encyclopedia of Mushrooms, “in unmanured or sparsely manured grasslands and roadsides and broad-leaved and mixed woods on poor soil”. Michael Jordan in Mushroom Magic says it grows “in gardens, on the edges of forests, on firebreaks and in grassy places near trees.” Basically it is found growing alone, or in small groups and sometimes as fairy rings, on unimproved land. This suggests, although I don’t know how much research has been done on the subject, that some species thrive in nitrogen-rich environments whereas others don’t, so their prevalence or absence may serve as an indicator of nitrogen pollution from over-fertilised pastures, agricultural run-off etc. The Shaggy Parasol is smaller than the regular Parasol, growing to around 5-15cm across, and though the scaly pattern on the cap is more pronounced, probably a more conclusive distinguishing feature is the stem, which is plain, smooth and lacking the snakeskin pattern, and becomes increasingly fibrillose and pink-brown in colour closer to the swollen base. This stem stains reddish-brown when bruised, as do the gills, while the flesh bruises a lighter saffron orange. 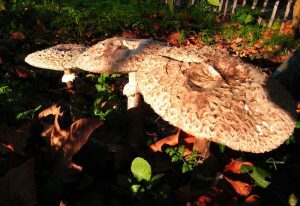 In all other respects, the two species do look very similar, but very recently the Latin name of the Shaggy Parasol changed from Macrolepiota rhacodes (the ‘rhacodes’ from the Greek for a piece of cloth, referring to its slightly ragged appearance) to Chlorophyllum rhacodes as it was reclassified to the same genus as the False Parasol. This taxonomical shift came about due to DNA evidence rather than readily observable similarities. Despite the change in Latin name, the Shaggy Parasol’s spore print is still white, not the green of its genetically closer kin. Most guide books still list the Shaggy Parasol as a Macrolepiota, while older ones include both Parasol and Shaggy Parasol under its original name of Lepiota. 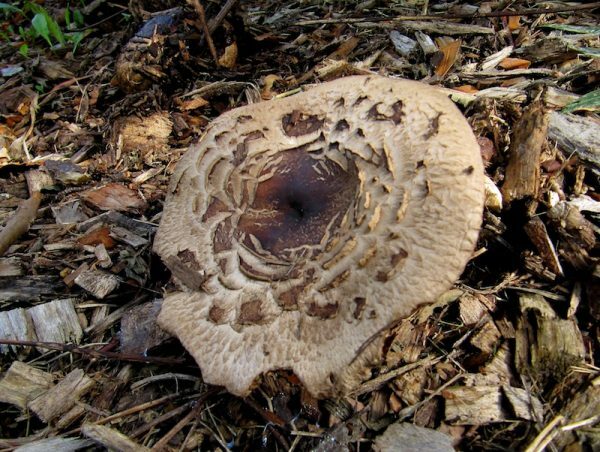 I personally have had no negative experiences with Shaggy Parasols, and it might be that any adverse effects from its consumption is connected to the coniferous woodlands in which it sometimes grows. I should also emphasise that my own trials are in no way intended as a culinary endorsement, and advise the same cautions as I have in previous posts such as, for example, this one on Chicken of the Woods from last September. 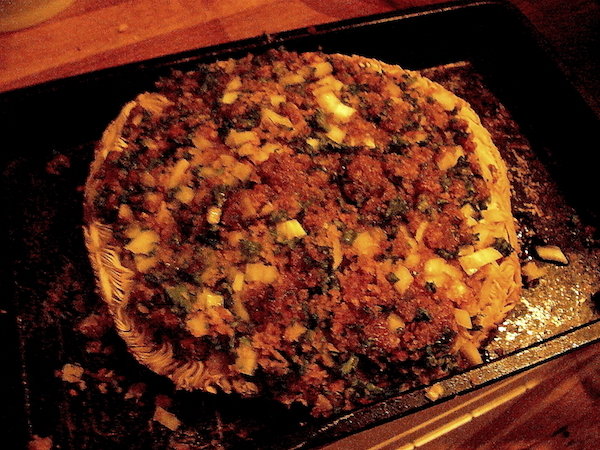 But if you can 100% positively identify a regular Parasol and you wish to give it a go, discard the fibrous stem and cook just the cap: the dimensions alone make them perfectly suited for a magical mycophagical alternative to a pizza base.